Greetings!!! Hopefully I'll be able to get back on track with my drama recaps soon, but I need to get this off my chest while the feelings are still fresh. It's recently been announced that VIXX will be hitting two cities here stateside. First and foremost let me make clear that even though I'm upset with how things where handled, I still bought tickets to support our boys and their tour. Though I'm not sure if these stops are to be considered apart of their VIXX Live Fantasia - Hex Sign Tour or if it's considered a stand alone event due to lack of communication, but I'll get to that later. and that we were to stay tuned. Great!! I'd never heard of this group before but VIXX was coming back to the states and that's all that mattered, right? Well this group decided that the best thing to do was be even more strict on what information they let starlight in on. Then on October 7, we were given two silhouettes of city skylines, Chicago and NYC. And that was it. No more information, just promises of a contest once they reached 1k followers and that a video announcement would be announced on Friday October 10th. Now, I'm not sure about other Starlights, but to me things felt a little rushed. I was honestly ok with that up until I saw that tickets where going to be going on sale for Chicago the same day as this supposed video announcement. Wait . . . what? Already? This was a bit worrisome. It had only been 6 days since this tour was announced and tickets are already going on sale? Not cool, particularly since we still had yet to be informed on what the ticket prices were to be. And to top it all off, we were never given any statement from Jellyfish Entertainment regarding this "concert". 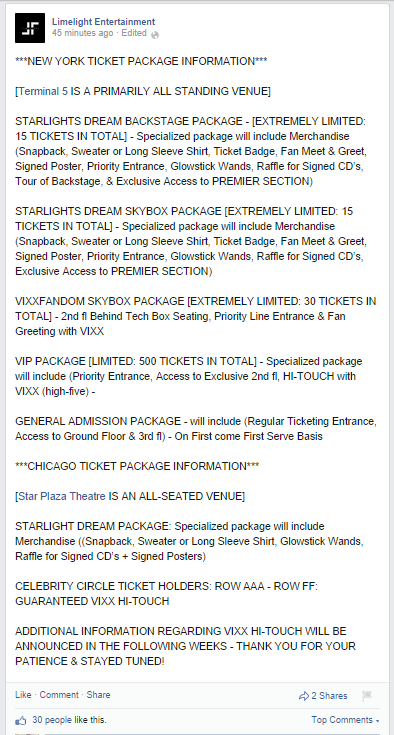 Honestly it felt like a scam right up until I saw VIXX listed on the Merrillville Star Plaza Theater's website. If VIXX's name hadn't been listed on their site I would not have bought my tickets. October 10th . . . . the day of Enkor Music's "Video Announcement" also the day tickets when on sale for the concert in Merrillville. Well 8 AM roles around, no announcement. Ok fine--its a little bit on the "early" side so maybe they needed a bit more time. 10 AM roles around, still no "Video Announcement". I'd like to be able to say I withheld personal judgment, but then one of their staff members posted this . . . Seriously . . . you're trying to lay blame on your slow internet to cover up your inability to release information on time? It's no wonder so many people thought you guys were a sham. This Tweet did nothing to make me feel better. And then the video didn't even have any new information. It's just a bunch of pretty pictures of the boys with flashy effects. But, even with all these problems //sigh// I still bought the damn tickets . . . as much as I would have liked to just say "Screw you shady company!!" I knew a certain someone would have been extremely sad (even though she says otherwise) if she could not have gone. And we got pretty decent seats too. 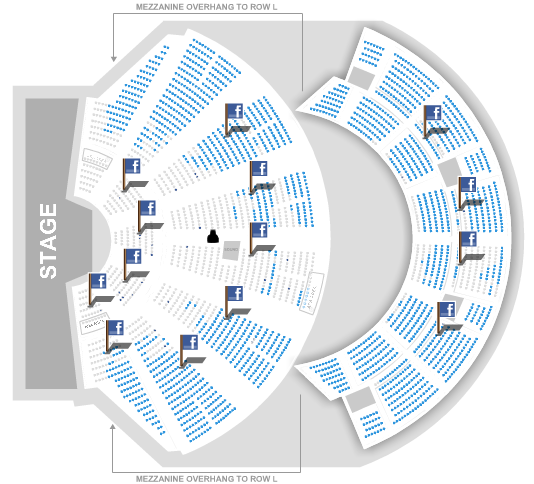 Our seats are at the top of that little black triangle on the isle. And now, after their latest Facebook updates . . . . I wish I hadn't. I want nothing more to do with this company unless they really start getting their act together. Oh I'm sure closer to the concert dates I'll feel better about the situation, excited even, but right now I'm pissed all over again. People finally have information on what is included in the packages Limelight is offering fans. Only problem is . . . The fans who could only make it out to Chicago/Merrillville got EXTREMELY shortchanged. They were graced with two options for fan interactions, while New York City received four options. This is most likely due to the fact that the concerts are back to back. These poor boys will be preforming in Illinois Saturday night, then flying directly to NYC to preform again the next day. //sigh// Ok . . . I'm done now . . . I've got some catching up do do on drama recaps. Later Starlights!